As I predicted yesterday, iOS 4.3 has now become available for developers with the hotspot functionality demoed on the Verizion iPhone 4 now available to all. It works by replacing the previous "Internet Tethering" functionality with everything being included under one banner. This means you can now tether your iPhone via Bluetooth, USB, or WiFI (along with 5 other devices). The carrier support is exactly the same as for internet tethering so if you are already paying for that (or get it for free), then you will be able to use the new hotspot functionality free of charge. 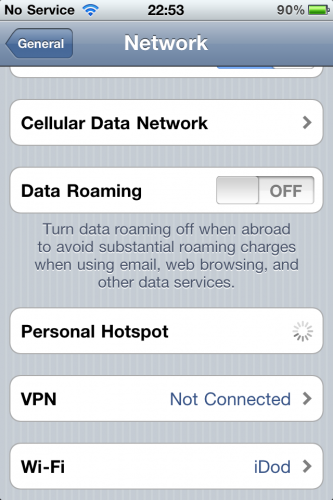 Unfortunately, I can't demo the hotspot at the moment as I don't currently pay for tethering. The reason for this is that my carrier (O2) charges an extra £7.50 per month for an extra 500MB to use for data tethering. You can't use the data allowance you already have. This is in stark contrast to Android in which you can use the device as a Wi-Fi hotspot with no charge at all - it just shares your existing connection. I was rather hoping that Apple would move away from this money-grabbing opportunity for the carriers but it seems not. In addition to this change, there is also an update for AirPlay relating specifically to the Apple TV. As I tweeted previously, you could enable AirPlay video streaming in 3rd party apps due to a private method on the MPMoviePlayerController class. However, Apple have now made this public with an update for the AppleTV as well. This means that 3rd party apps can now stream video to the AppleTV which is great news for apps such as MLB (which mean I can stream video from my iPad to my AppleTV - no more baseball games on the iPhone for me!). Other changes are mainly cosmetic with a slight rearrangement of the settings panel and some new multi-touch gestures for the iPad. Interestingly, Apple have responded to the controversy around the reassigning of the "orientation lock" button in iOS 4.2 on the iPad by now enabling you to choose whether you want it to act as a silent switch or an orientation lock. All of these changes are things I'd predicted but I'm really glad to see Apple have implemented them. Video streaming over AirPlay and Hotspot on the iPhone are two great new features. Roll on iOS 5.0! If you have any specific questions about iOS 4.3, either get in touch via email or chat to me on Twitter.